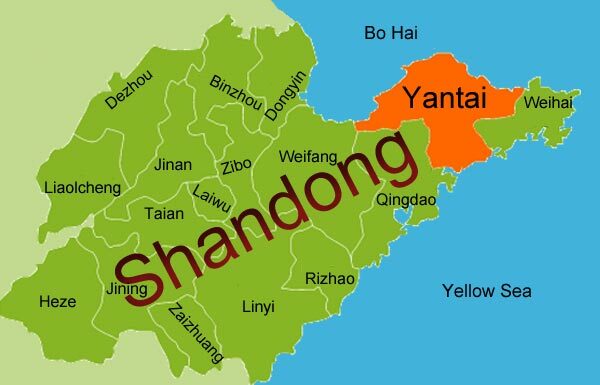 Yantai is located in the northeast corner of the Shangdong Province. It is bordered by the Bohai Sea and the Yellow Sea, and lies across from Japan and South Korea. Yantai holds significant promise for businesses looking to secure foreign trade partnerships, and currently has partnerships with over 200 countries and regions worldwide. Located in the economic circle of the Bohai Sea, Yantai has been witnessing rapid economic development since the reform and has developed a well-established industrial foundation. The Yantai Laishan International Airport opened in 1984, and is a combined military and civilian airport. The airport has over 50 domestic and international routes, which service 270 flights per week. International routes include: Hong Kong, Taiwan, Korea, Japan, Europe, and the United States. However, Yantai Penglai International Airport is currently under construction and will replace Yantai Laishan International Airport once completed. Located in the west coast of the Pacific Ocean and north of the Shangdong Penisula, Yantai Port faces Japan and Korea, the Liaodong Penisula, and is one of the leading ports in North China. Yantai’s port is among the top ten in China. There are 88 berths, including 45 deep-water berths for vessels of over 10,000 DWT. The maximum berth depth is -28m, and can receive large vessels of up to 400,000DWT. Yantai Port’s total assets consist of 2.6 Billion USD, with an owners’ equity totaling 1.1 billion USD. The Green Rongcheng intercity railway is the Shandong province’s first regional intercity high-speed railway. It connects Yantai, Qingdao, Rongcheng and Wieihai. The travel time between Yantai and Qingdao is approximately an hour and a half. The Yantai-Dalian rail ferry also boasts a shortened distance of 1600km form the northeast area to the Shandong Province and East Coastal areas. Purchasing a ticket (in Chinese): http://www.12306.cn/mormhweb/. Yantai Railways station also has services to Beijing, Shijiazhuang, Shanghai, Xian, Qingdao, Jinan, Xuzhou, Zibo, Jiamusi, and other domestic cities. Ticket Office: Trains tickets are available from the railway station and some ticket agencies. China National Highway 204 runs from Yantai to Shanghai. It covers a distance of 1031 km and travels south from Yantai, going via Jiangsu and Shandong provinces to end in Shanghai. There are multiple bus stations in Yantai, and they range from offering long-distance routes to routes to nearby cities. Yantai-Qingdao takes 3 hours on average, Yantai-Jinan takes 3.5 hours, and Yantai-Wieihai takes around an hour. Fast-growing businesses are showing promise for future economic development. One of Yantai’s key strengths is its inbound foreign investment due to its close proximity to neighboring countries and its sea port. Over 90 countries and regions have invested in Yantai and many multinational corporations have set up operations in the region. In addition, Yantai has strong foreign trade markets and partnerships with more than 200 countries and regions worldwide. In 2011, the total imports and exports reached US$45.3 billion (exports 26.7 billion USD, imports 18.6 USD). The most prominent trading partners of Yantai are the US, Japan and South Korea. In 2011, Yantai’s GDP of US$77.9 billion ranked 20th in China and the 2nd in the Shandong province after Qingdao. In 2012, public budget revenue reached over 5.6 billion USD, an increase of more than 802 million USD from the previous year (17.9 percent increase). The Yantai Economic and Technological Development Zone was incorporated in 1984 and is one of the earliest approved state level economic development zones in China. It has a developed area of around 10 square kilometers, and GDP of around 16 billion USD, and utilized FDI of 410 million USD. The zone is located less than 10 km from Yantai Laishan Airport, the G204 Highway and Yantai Port. Major investors include: Daewoo, GM, Foxconn, Denso, Asahi Kasei, Henkel, LG, Toyota Tsusho, and Hyundai. Industries encouraged within the zone are automobiles, IT, machinery, electronics, textiles, bio-pharmaceuticals, food processing and chemical fibers. The Yantai Hi-Tech Industry Development Zone is located in the eastern part of Yantai City, and was incorporated in 1998. It is an internationalized science and technology industry park opened to the Asia-Pacific Economic Cooperation(APEC), with four other hi-tech zones in Beijing, Suzhou, Xi’an and Hefei. It is authorized by Ministry of Science and Technology to set up the only Sino-Russia Hi-Tech Industry Cooperative Example Base of China. In 2010, it upgraded to the national-level Hi-Tech industrial zone with the approval of the State Council. The zone has a total area of 48.8 square kilometers and a resident population of 75,000 (2012). This area is one of the most active and holds huge economic development potential for Yantai. Hi-Tech projects of new materials, biological engineering, chemical production/processing, pharmaceuticals, and telecommunications equipment are encouraged industries in the zone. The Yantai Export Processing Area is located in the northern part of Yantai. Established in 2000, the area has a total land area of 2.96 square kilometers. The Yantai Export Processing Area has a good transportation network, and is located close to the Ferry port, train station, major highways, only 17km away from Yantai airport. In 2012, the cargo traffic of Yantai Port was greater than 200 million tons. Major investors include Dongyuan Auto Parts, Hurada Chemicals, Hongxing, Beiming Logistics, Kerry EAS, and Sunshine Logistics. The major industries encouraged are automobiles, machinery, bio-pharmaceuticals, machinery, fine chemicals, chemical fibers, new materials, electronics, light industries and textiles. In the first five months of 2012, export and import value of the zone was greater than $1.96 billion USD, representing a 72.5% increase.